The country's efficient market environment, conducive to the availability of venture capital, and the sophistication of financial markets, was also given recognition. Denmark is now regarded as the world leader in technological advancement, with its Nordic neighbours Sweden, Finland and Norway claiming second, fourth and 10th place respectively. European countries to make the top 20 included Switzerland in fifth place, the Netherlands, one of the most improved in sixth, the UK (nine), Germany (16), Austria (17) and Estonia (20). While countries from Asia and the Pacific continued to progress, the powerhouse economies of China and India both showed a downward trend. India was four positions down on last year to 44th, suffering from weak infrastructure and a very low level of individual usage of personal computers and the internet. 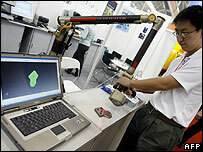 China was knocked to 59th place, nine positions down, with information technology uptake in Chinese firms lagging.